In 1945, the Japanese cities of Hiroshima and Nagasaki became the first and last victims of the atom bomb, the most destructive man-made force our planet has ever known. Or were they just the latest in a long line of Armageddon-level events? Is it possible that our civilization is, in reality, just one of many? Did previous cultures blossom, develop, and thrive, only to destroy themselves, tens or hundreds of thousands of years ago, with the same atomic technology? 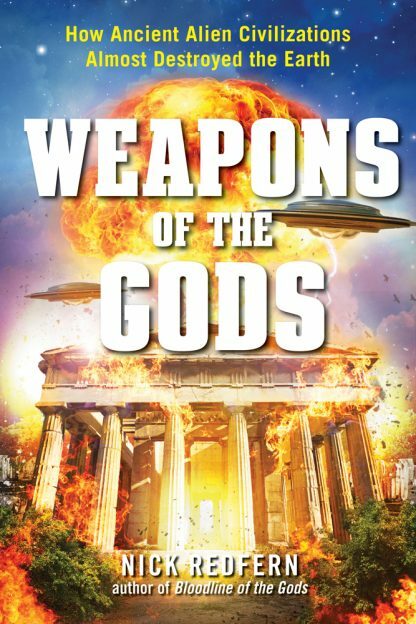 These are the controversial and thought-provoking questions at the heart of Nick Redfern�s Weapons of the Gods, which argues that many ancient civilizations cracked the secrets of the atom, only to become the victims of its awesome, terrifying power. Still others may have been destroyed by hostile aliens with their own nuclear arsenals. Where is the evidence? The answer is shockingly simple: it�s everywhere. It�s just a matter of knowing where to look for it, from the biblical cities of Sodom and Gomorrah and the ancient Pakistani culture of Mohenjo-daro, Pakistan, to the Lonar Crater in India and the revelations in the Ramayana and Mahabharata, two ancient Sanskrit texts that describe nuclear warfare thousands of years ago.